It was at the end of last month we reported Apple slid into GDC 2013 to court game developers under a fictitious name. Word was the tech giant was dipping its toes in game controller waters, something patents have suggested it was interested in developing on its own before. 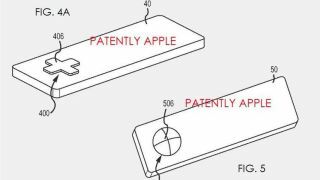 Now, another patent - picked up by Patently Apple - has surfaced that puts a little more water in the well of rumors that Apple is indeed looking at the gaming biz, or perhaps a game controller for a future version of Apple TV. The game-related patent isn't for a bit of hardware as big as a console or even controller; nay, we're not talking anything larger than a button. However, Apple's button, unlike the volume knobs we've grown accustomed to on the iPhone, would come to future products acting like one found in traditional game controls. Apple says of one patent figure, "The pivoting button...is configured to move in four directions (up, down, left and right, for example) via four buttons coupled to a four-way pivoting body, and may be a four-way navigation device to navigate, for example, through menus or through a video game. "The [device] may be a remote control, a game controller, a personal electronic device or any other device." So while the button could be put on any one of the Apple products we see on the market today, the fruity firm felt it necessary to call out "a game controller" as a possible future home for its pressers. On another illustration, Apple says that the pivoting button may have "a continuous navigation pad (e.g., not limited to only four directions)." Could this be a sign towards the new categories Apple CEO Tim Cook alluded to during the company's recent earnings call? Unless Apple plans to license its button technology or wanted to make sure it had this super-neat idea secure, we think something else cooking in Cook's kitchen. As scintillating as buttons are, Patently Apple published a few other patents today outlining some vehicular potential for the iPhone. The basic run down is that Apple envisions ways to turn the handheld device into an all-access car controller, one that can open doors, start and turn off engines, and do a whole lot more. Apple's even concocted ways to make it so a particular device must be present for a car to start. Those who hate having to readjust their mirror every time someone else drives can appreciate another patent that would automatically activate personal settings once a particular iPhone passes a credential check. It's also thought to make it so a car owner can control what hours of the day their car can start, meaning one could deactivate it overnight, for example, and prevent thieves from making away with their ride. A wireless connection is given a prerequisite for this set up, as is a thorough communication channel between Apple and car manufacturers, but as electronics find ways to be integrated ever deeper into our vehicles, we see some mano-o-iPhone conversations are taking place. While we don't suggest chucking your keys just yet, the ideas presented in Apple's patents offer a glimpse at a pretty cushy connected car future.